Condo, 2 Bedrooms + Convertible bed(s), 2 Baths, (Sleeps 4-6)5. This condo has it all. The view is breathtaking. The condo is located on the ocean side of Shore Drive. NO ROADS to CROSS. Has a lovely view of the pool and ocean. Can't go wrong with making this your place to stay while on your vacation. LOCATION! LOCATION! LOCATION! The condo has been recently updated and has all the comforts of home while you are on vacation. 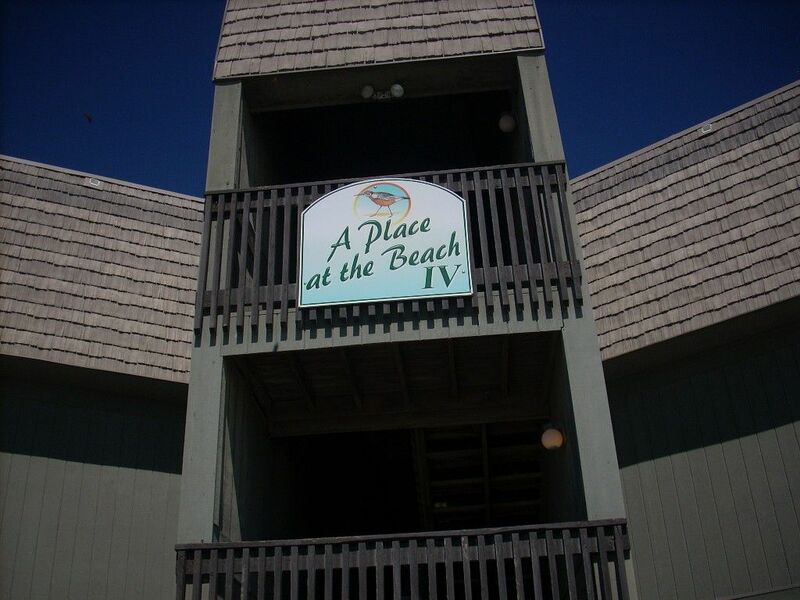 This extra special, second floor corner Condominium is located in one of Shore Drive's most popular oceanfront condo communities, A Place at the Beach IV. APATB IV offers a heated pool in the spring and fall. You can walk the pier, fish on the pier, play in the arcade area and/or eat in their restaurant! THERE IS NO ELEVATOR AND IS NOT HANDICAP EQUIPPED. Pets are NOT allowed. A $100.00 A DAY FINE FOR PETS THAT DO NOT HAVE THE SPECIAL TAG ISSUED BY THE HOME OWNERS ASSOCIATION. Smoking NOT permitted inside of unit. This vacation condo sleeps six with two bedrooms. The Master bedroom has a KING size bed with a private bathroom and the guest bedroom has two twin beds. There is a queen size sleeper sofa and two recliners in the living room. It has a fully equipped kitchen with eating area. Amenities include: LINENS (except for beach towels), beach chairs, laundry facilities down the hall from the condo, departure cleaning, nearby attractions, and one of the most beautiful beaches in the country. This lovely Condominium offers the space and comfort of home! Close to golf, fishing, Restaurant Row, great night life, and all of Myrtle Beach's major attractions. Only a short walk to the Apache Pier and easy walking distance to the Straw Market. It is just five minutes away from Barefoot Landing, with over 100 shops and entertainment such as Alabama Theater, House of Blues, Alligator Adventure, and many great restaurants. Less than ten minutes away from Broadway At The Beach, with shopping, Ripley's Aquarium, Planet Hollywood, Hard Rock Cafe, Dolly Parton's Pirate's Voyage and mandy more restaurants and attractions. This vacation rental is less than three miles from Tanger Outlet Mall, Rossi's, Super Wal-Mart, Kroger's, and a Food Lion grocery store. Carolina Opry and Pirates Cove shows are only five miles away. Close to many of the 100+ golf courses in the Myrtle Beach area. Within 1/4 mile of Arcadian Shores Golf Course and The Dunes Golf Club. You can contact us via e-mail or by phone to 'hold' a week, deposits are required within 5 days. Please note Unit 244, A Place At The Beach IV, and reservation week on deposit. Deposits are $400.00 and must be a Money Order or Bank Check made payable to Barbara Motley. The balance of your rental fee is due 4 weeks prior to your vacation. When we receive your deposit, you will be mailed a receipt and rental agreement with instructions on sending the balance of your rental fee. We keep our calendar current. If you don't see your week available, check out our other unit at vrbo #59703. *Rates are subject to change. Rates quoted through VRBO are not always correct. We quote every week/month requested through email correspondence. This property is owned and managed by the Motley Family of Manassas, VA.
We chose to buy in the Oceanfront community because it is located on popular SHORE DRIVE in Myrtle Beach an is close to 'everything' the beach has to offer. It is also located on a dead-end street limiting traffic to those who live or stay in the Shore Drive area. This unit is located on the second floor of the building at the parking lot end and is the first unit at the top of the stairway - no need to walk through the building when you arrive. The views from the balcony include that of the ocean and swimming pools. Cable TV in bedrooms and a DVD/VCR in living room, Swimming pools located on premises, No Smoking and no Pets. # * Golf * Theme Park (Amusement Park) * Zoo/Wildlife Park * Shopping * Sightseeing * Restaurants * Sailing * Boating * Parasailing * Jet Skiing * Shelling * Swimming * Snorkeling/Diving * Surfing * Windsurfing * Biking * Hiking * Fishing * Rock Climbing * Fitness Center/Gym * Health/Beauty Spa * Cinemas/Movie Theaters * Live Theatre * Museums * Miniature golf # Other Activities * AWESOME HEATED POOL ONSITE in Spring and Fall! Apache Pier for fishing and nightly entertaining, Ocean Annies for nightly entertainment, Nearby Embassy Suites for Starbucks, gym, indoor pool! The condo was very clean and decorated beautifully in a beach theme! We had a wonderful view of the ocean/pool from our balcony. This was our 17 year old son's first time seeing the ocean and our first time visiting Myrtle Beach and we all loved it. I would have to say this was by far the best family vacation we have had in 17 years and we will definately be booming again next year. This condo was in a wonderful location right on the beach. The Apache Pier is the longest wooden pier in the east coast and in walking distance. It has a restaurant, arcade room, live bait and tackle, fishing pole rentals, fishing off the pier and live music in the evening. Leslie and Barbara we wonderful with any questions we had before our trip. Thank you so much for sharing your beautiful rental condo with our family. We are so happy you and your family enjoyed your stay. We welcome you back any time! I'm glad you were able to take advantage of having the Apache Pier near you. It's a great place to go to. The condo is clean, has everything you need, and in a great location. The pool is nice, and this condo overlooks it. Also felt safe there. The owners were great to work with when we booked very last minute. Hope to go back! It was a pleasure working with you. We are delighted you enjoyed your stay. We hope you come back in the future. Property had everything we needed! Will book again! Thank you! Look forward to having you return! My husband and I had a great two week stay with sunshine everyday! I definitely recommend this condo for what a stay on the beach is suppose to look like. Very clean with all the amenities you would find within your own home. The beach is literally steps out the door. No elevators to wait on or parking garage to hassle with. You couldn't ask for a more friendly and gracious person than Leslie to work with to coordinate your stay. The Sport & Health Club at Kingston Plantation offers weekly and monthly memberships, There is a Starbucks Coffee shop and an Omaha Steak House at the Embassy Suites at Kingston Plantation (just a 10 minute walk on the beach).